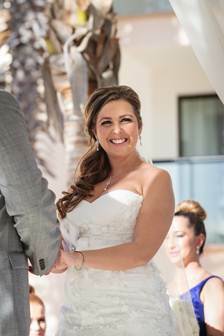 Beautiful bride Nicole got married this past January at the Hyatt Ziva Los Cabos. Nicole’s bridal style was a classic and romantic look. 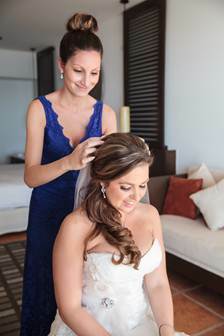 With her long, dark hair and sweet smile, it didn’t take much to give Nicole that unforgettable wedding-day glow! 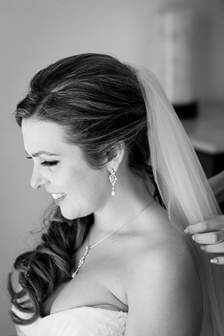 This bride’s thick, long hair was great for a sideswept cascade of curls. We made sure to ramp up the volume before styling Nicole’s hair in a flowing down-do that left one shoulder open to show off her strapless gown. For her make-up, we kept Nicole’s look very natural, with well-defined lashes and a neutral lip. We try to use minimal make-up for outdoor weddings—just enough color to stand out in photos is the perfect amount. We think Nicole’s beauty definitely comes out in the photos—she looks absolutely stunning! 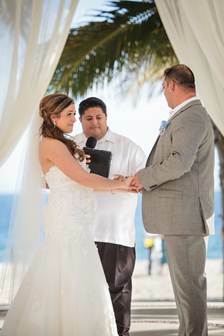 This entry was posted in Cabo Bridal Hair and Makeup and tagged beach wedding hair, beach wedding makeup, Cabo mobile spa, Cabo wedding hair, Cabo wedding makeup, Cabo wedding salon, destination wedding hair, hair and makeup Hyatt Cabo, Hyatt Cabo wedding, Hyatt Ziva Los Cabos, natural wedding makeup, outdoor wedding makeup, Suzanne Morel, wedding down do.